April 16, 2019: As of 2019, another new hearing aid is being advertized as the latest technology that sells for less than $600. What is obvious is that there is no federal control of hearing aids to tell us which hearing aids really do work. It is a wild west show! May 02, 2016: Consumer electronics industry, with emerging technologies, is putting pressure on the traditional hearing aid marketers, the six major manufacturers and the FDA to reassess the entire cumbersome hearing aid business. Technological advancements outside the hearing aid industry are producing better hearing aids that are much less expensive than those of marketers; thereby challenging them. This is good news for the millions of those in need of hearing aids, as only 15% to 30% of those who could benefit from hearing aids use them. Pollock: Hearing aid industry under pressure 2016 Medicare and most health care insurers do not pay for hearing aids, although some marketers like Kaiser Permanente have in-house discounts for their super expensive products. We should expect new changes in the hearing industry within the next year. Are you someone who has difficulty hearing, and is starting to look for a hearing aid? You have come to the 'help place'. If you have already searched for a hearing aid, you probably found that your search can be confusing. There are so many different prices and options. Woww! These aids really do cost a lot, from $ 300 up to $8000 per one hearing aid. And different companies seem to sell the same thing .... a hearing aid, but at different prices and confusing benefits. So which hearing aid is best for you and fits into your budget? This article attempts to provide you with the information you need to know in one place so you can make an informed decision. We have the hearing aid solution that matches your need, your lifestyle and your budget. Independent Hearing Aid Center's advertisements make it appear that they are the only ones who can help you. They use different gimmicks to recruit, hook you and then sell you their product .... For example, when you explore their advertisement on the internet, the add gives you skimp information and then asks you to fill out information so they can send you a brochure or make an appointment for you and so on. They did not mention a contract agreement. What they are doing on the internet or telephone is getting your information so they can contact you and then lure you to their office. This is bad strategy for you because they then start to pester you for a sale. 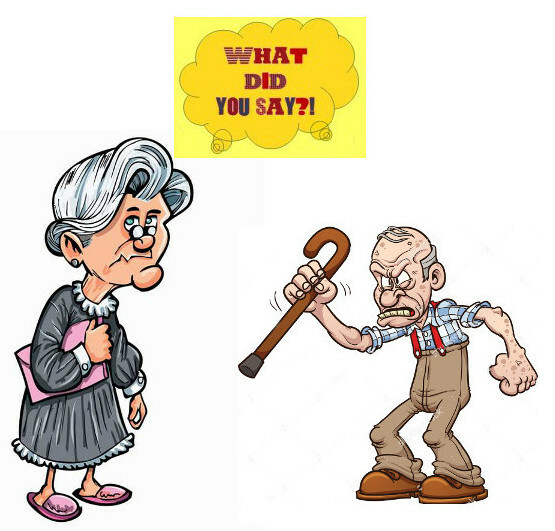 Two of my hearing aid interview specialists overlooked discussing adequately features such as Bluetooth, remote control, telecoil, feedback suppression, noise reduction, and manual-volume control. Hearing Aid centers often do not give you all the information that you need to make an informed decision to improve your hearing. Instead, they are interested in selling you their product. Buyer beware! Best Advise: What you need to do is to become better informed about your hearing problem and ALL hearing aid options. This approach requires that you compare the numerous hearing aid options in the quiet comfort of your home, without any sales pressure. And yes, feel free to discuss hearing aid options with you family, friends and medical counselors. Contact your Health Care Provider first to find out if you have a hearing aid discount policy. Ask if the hearing test is covered in the policy, which hearing aid provider is in the policy and which hearing aid manufacturer makes the hearing aid. When you have all the information, then consider going for a hearing test and so on. But get most or all the information up front before contacting any hearing facility. Become informed! Try to identify the features you may need. Most hearing centers will try to sell you features that do not improve your hearing and these extras increase the cost significantly. So to resolve this excess waste and jacked up expense, try to find a consulting firm that works with your best interests at heart. "Where we could verify the wholesale price of the aids we tested, the average markup was 117 percent, so there's room to bargain. Only 15 percent of our survey participants tried that, but more than 40 percent of those who tried succeeded. Cheryl Wruk, 62, a county board member from Crivitz, Wis., got her aids discounted to $1,500 from $1,750 by declining promotional extras such as a $100 gas debit card. A large number of those fitted by hearing specialists with a hearing aid had incorrect adjustments." Consumer Reports hearing guide 2015 Make a list of all the features, then ask the audiologist or hearing specialist to identify the features you really need. Then bargain for the "real essentials price! Most hearing aid centers provide similar free extended services such as adjustment to hearing aids, advise you on hearing aid care such as cleaning, maintenance, battery replacements and operation of your hearing instrument. Centers offer various warrantees, exchanging hearing aids procedures and so on. As you can guess, there are many features that you can bargain about! Although this article summarizes hearing aid information for your convenience, you should read the Consumer Report on hearing aids 2015, for excellent detailed information about hearing aids. What kind of hearing do you have? Do you turn the volume up high when you are listening to the TV? Do you have difficulty hearing when you are using the telephone? Do you have difficulty understanding the end on word syllables like bite and night, house and mouse? Do you have difficulty understanding what others are saying at a party when there is environmental noise? If you have any of these hearing problems, then you may need a hearing aid. 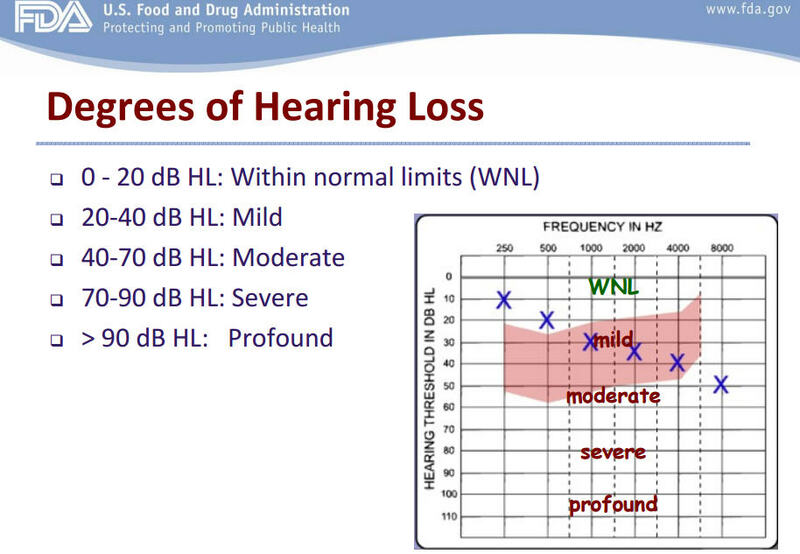 Once an audiologist identifies the degree of hearing loss in your ears [ mild, moderate, severe ], then a chart can be printed out, as illustrated in the example on the right. Then the audiologist can match a hearing aid that is best for you. Hearing aids range in the number of channels, from the basic low 8, to 24, 32, and 48 which is supposed to be the best. Ofcourse, the price depends on the number of features and the number of channels, with 8 channels being the lowest cost and the price goes up from there. 1. The manufacturer does not sell the heating aid. 2. Hearing distributor companies are the real providers .... they sell a hearing aid product. 3. Health care providers like Kaiser Permanente contract with marketing hearing aid centers like HearUSA and Costco contracts with Kirkland, who do the hearing tests and market a variety of hearing aids. 4. The prices quoted for a hearing aid can be very misleading and do not imply quality or good hearing. Prices can be negotiated! a. The degree of hearing loss as determined by an audiology test. b. The number of hearing channels each hearing aid has. The higher the number of channels, the better the ability of the aid to provide hearing in different environments. Channels are the closest to comparing "apples to apples' for quality and best buy! 6. Most sellers add extra features that may not be necessary and may not improve your hearing but add to the cost. You should bargain to get rid of the unneeded ones and lower the cost! 7. Hearing aids are medical devices and are FDA or government regulated. But Personal Sound Amplification Products [PSAPs] turn up the volume on soft voices and other sounds, are sold over the counter, they cost $10 to $600 and are not regulated by the Food and Drug Administration because they’re not considered medical devices. 8. Ask whether the audiologist will “unbundle” or separate the cost of a hearing aid from fees for fittings and other services. Not all will, but “it makes the cost more transparent." That may help you negotiate a discount. 9. Ask whether you can get by with one hearing aid instead of two. 10. Many persons receive hearing aids that are not adjusted properly. Adjusting an hearing aid requires a trial period to correct such issues and becomes an added expense that can be lowered with a good hearing aid specialist. 11. Allow yourself time to adjust and request fine tuning. 12. Involve your family members to understand hearing loss. New hearing aid kids on the block include: Smart Listening System from Soundhawk for $400 for single ear; Bean from Etymotic Research for $ 300; CS50+ from Sound World Solutions for $300; CrystalEar from NeutronicEar for $545. Pollock: Hearing aid industry under pressure 2016 These are not included in the table below! ME-2, has 36 channels which gives a hearing score of 74-50, @ $4700. ME-4, has 16 channels which gives a hearing score of 24-16 @ $2800. Advanced Affordable hearing aids priced from $ 129.00 to $379.00 per one ear; company states that this is a real hearing aid and not merely an amplification device. Customers who bought a NCX hearing aid claim this NCX product is equal to their previous more expensive $ 4000 hearing aids. Advanced Hearing is an online distributor & hearing aid needs to be purchased for a one month trial and purchaser would make the hearing device adjustments at home. This information has not been validated. AudioMatrix: Colorado Springs, CO 80909; Phone 1-800-820-8040 Email: info@hearingaids.pro; sells Phonak Audeo V90=8 channels; V30 $ 995; Audeo V 50; $1195 - $1295. LifeEar Hearing Amplifier [ PSAP device ] selectively amplifies speech, separating it from background noise and sounds using 12-band digital sound processing. Helps you hear better and understand conversation more easily. Has adjustment issues. Amazon Mail order for $ $379.99 includes hearing aid and batteries which may not last long. The above table lays out the essential details to illustrate how the hearing system works. Needless to say, the distributors like the certified specialists or audiologists, nor the providers and manufacturers do not want to talk about these features. This table also compares the cost of one hearing aid among the distributors. The cost for equal quality technology and features for ReSound appears to be one-fifth the cost of a similar Siemens aid at HearUSA. This is the kind of comparative shopping you need to do! Types of hearing aids: As you can surmise from the table above, hearing aid distribution centers may not share all the information about their hearing aids. 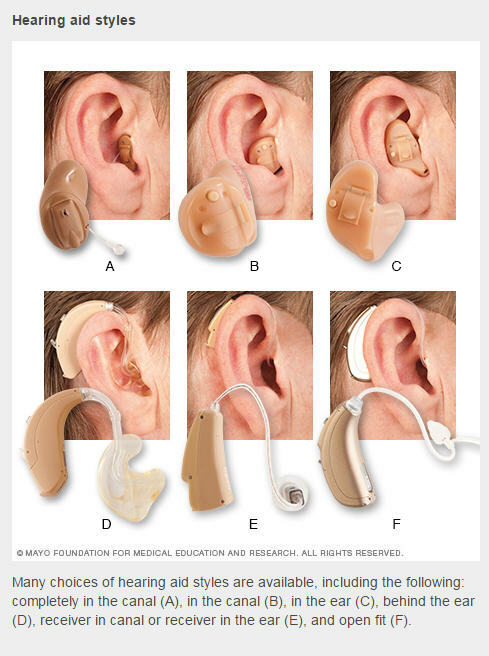 For example, one center only shared types of hearing aids as, Custom shells, Open fit and Behind the ear. Hearing aids are categorized by the place on the ear they are worn, and possibly by the number of pieces [ behind-the-ear aids are two pieces; an in-the-ear aid is one piece ]. Smaller hearing aids offer fewer features and might be more difficult to manipulate and adjust. People with more severe hearing loss might get better results with a behind-the-ear model with ear-molds or an in-the-ear model. In the Consumer Report survey, owners of behind-the-ear, open-fit designs, reported the most improved hearing in loud social settings. The ideal hearing aid for you depends on the severity of your hearing loss, your lifestyle, and your manual dexterity. List of major hearing aid manufacturers: Who makes the hearing aid may not seem important at first glance, but according to the experts, some manufacturers do have better technology. Sub-sidiary Siemens is one of them and the cost of their hearing aids shows it. Others include Oticon, Starkey, Phonak, ReSound, Unitron, Sonic, Micro-Rech, Bernafon and Widex. Be sure to ask your distributor and audiologist for this information. MICROPHONE: The microphone helps the hearing aid to pick up sounds from outside the ear. There are different types of microphones, both omni-directional (sensitive to sound from all directions) and directional (sensitive to sound from specific directions). AMPLIFIER: The amplifier processes and strengthens the sound signal from the microphone and customizes it according to your individual needs and your hearing loss. It makes the sounds you hear recognizable without being distorted. The amplifier contains most of the hearing aid’s electronic components and circuits in a microchip. MICROCHIP: The chip is the nervous system of the hearing aid. Despite its micro size, the chip is incredibly powerful and can handle everything from signal processing to wireless communications. The chip means that hearing aids can be smaller and use less battery power. RECEIVER: The receiver or speaker converts the electrical signal into sound and sends it to your ear. How much sound comes out depends on its size. A severe hearing loss will often require a slightly larger hearing aid. Receivers also come with wax guards that help to keep moisture and earwax from entering the hearing aid. 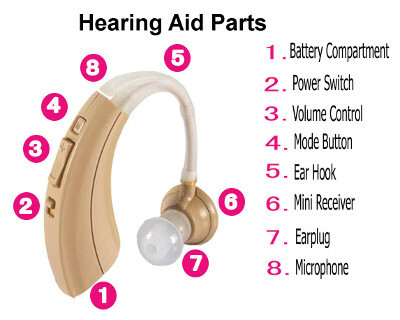 BATTERY: The engines of the hearing aid, batteries keep the whole thing running. How much power a hearing aid uses varies widely depending on its size, the number of features and the ways in which it is used. Telecoil - A telecoil is a small coil [antenna] inside your hearing aid. The coil works as a small receiver which picks up signals from a loop system that acts as an electromagnetic field. Hearing aids with an activated telecoil can convert this electromagnetic field into a sound signal. Only the signal from the loop system’s microphone is amplified, and background noise is shut out. Audibility Extender - The Audibility Extender helps people with high frequency hearing loss to hear upper frequency sounds by moving these sounds to a lower frequency region where it is easier to hear them. The upper frequency sounds are important for hearing the “softer” sounds like /s/ and /t/ in women´s and children´s voices and high-pitched sounds like the “ping” of the microwave. Speech Enhancer - The Speech Enhancer is different from simple noise reduction systems in that it doesn´t just dampen noise - it also amplifies speech. When we listen to a sound, we are rarely in doubt as to whether it is speech or noise. The Speech Enhancer in modern hearing aids is able to distinguish the two in much the same way as our brains do – by using the fact that speech consists of a number of varying sound components that follow each other at brief intervals. Feedback Cancellation - Feedback Cancellation is a feature that aims to eliminate the whistling and howling caused by a microphone and speaker being too close to one another. With hearing aids, feedback whistling occurs when amplified sound from the ear canal leaks back to the hearing aid microphone. With less modern hearing aids, a whistle or squealing sound from someone’s ear could give a clear sign that they were wearing a hearing aid. The compressor - The compressor in a hearing aid is the feature that adjusts gain according to the current sound environment and the client’s hearing loss. Wireless communication - Technology to ensure that your hearing aids can communicate with other devices like your TV, mobile phone or other devices. Hearing aids may have some o all of these features, but this does not mean that these features really help you to hear properly. For example, often heating aids are not adjusted properly, such as hearing local converation better but also picking up away irritating environmental noise or conversation at the same time. Behind-the-ear (BTE): The receiver is inside the ear canal. It goes by various acronyms: behind-the-ear (BTE), receiver in the ear (RITE), receiver in the canal (RIC or RITC), and canal receiver technology (CRT). It has a banana-shaped case and a piece that inserts into the ear canal. Behind-the-ear hearing aids attach to the ear via a custom-made ear-mold that fits snugly in the ear, or a "dome style" or non-custom canal piece. Pros: Comfortable, barely visible. Prevents a plugged-up feeling, easy to insert, and compatible with telephones. You usually can get a hearing aid in one day, because custom ear-molds are not necessary. Cons: Wax and moisture may limit life of receiver. Does not allow for significant amplification in the low frequencies. Limited in terms of the potential to add amplification. Price: $1,850 to $2,700 for one hearing aid [ year 2008 price ]. HearingHealthCare Centers Video - How hearing aids work Length 2:33 mns. Paying for a hearing aid: One thing you should have noticed in the above Consumer Report hearing aid comparison are the price quotes as compared to the above Sorochan prices. The Consumer Report prices are for 2008 whereas the prices for Sorochan aids were for 2016. If you are a war veteran, first determine whether you are eligible to get your aids at your nearest Veterans Affairs facility. For everyone else, Consumer Report Consumer Reports hearing guide 2015 suggested choice is a medical office headed by an otolaryngologist [an ear, nose, and throat physician] that employs an audiologist. Your health care provider usually pays for the hearing test. Feel free to also contact Hearing Aid Centers and ask for information about their hearing aid options and services if you need to but hold off on scheduling a hearing test and so on. Batteries: Hearing devices need small batteries to work properly. Different hearing aids are made with different size batteries. The life of a battery depends on how long a hearing device is used and can vary from one day to a week. Some batteries can be recharged but most are replaced after a short use. Battery replacement can become a real hassel. How long will a battery last? Usually 5 to 7 days. The more severe hearing loss a person has, the shorter the battery life. Also hearing loss can vary from ear to ear. That means you shouldn't expect equal battery life. More advanced hearing aids require more power and bigger batteries. A battery also will drain less in a library setting versus a restaurant or rock concert. Turning up the volume on your hearing instrument in a noisy setting can prematurely drain the battery. When the battery power has been depleted or drained, it will send an alarm signal to make you aware that you need to replace the battery. A hearing aid comes with a pre-fitted battery size. Tax write-off: You may be able to get a good tax deduction if you itemize both your hearing aids and their batteries. For example .... A taxpayer in the 28-percent bracket who set aside $5,000 in such a medical account and used all of it for a $5,000 pair of hearing aids would reap an effective tax savings of $1,400. Health-care costs that exceed 7.5 percent of your adjusted gross income can be deducted from your federal income taxes if you itemize. Byrne: Beating prices 2016 Consult with your tax man. When purchasing a hearing aid you should be confident in your hearing health provider, the stability and longevity of the business, and the equipment he or she is using to provide your hearing loss solution. Another important part of your purchase is the availability of on going help. When you notice a problem with your device or need to come in for adjustments, cleanings, counseling, or for supplies, you want easy access to that help. In short, you need the peace of mind that comes with knowing you will be taken care of no matter what. Do your homework and good hearing! Consumer Report, "Hear better without blowing your budget," On Health, May 2016.